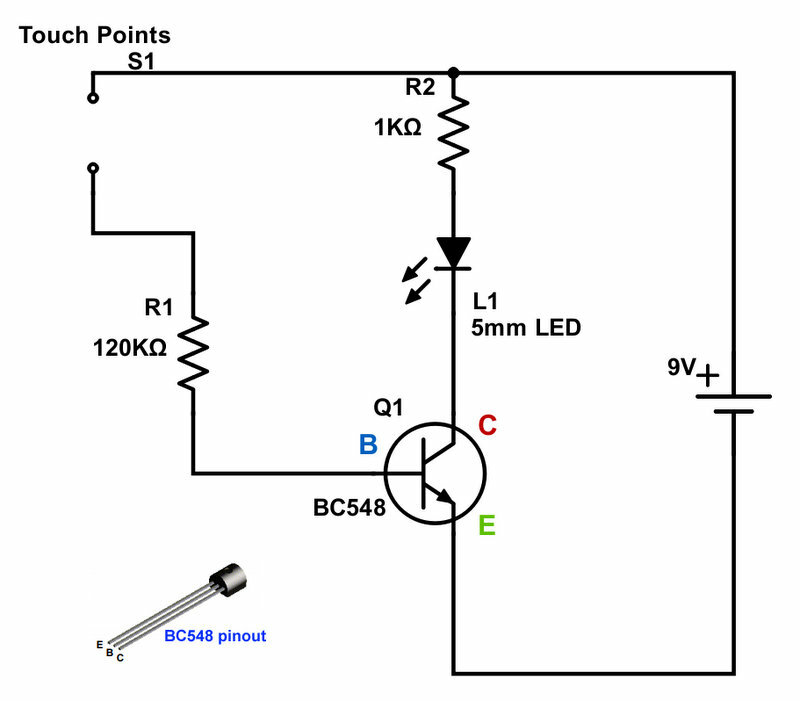 How NPN Transistor Touch Switch Circuit Works? When you touch the 9V positive wire and the open side of the 120K resistor in the circuit, very small current flows through the circuit. This current is determined by the electrical resistance of your body and the 120K resistor. For practical purposes, we can ignore the base to emitter resistance of the transistor. The human body resistance usually is in the order of around 100K. This means that the approximate current flowing through your body and through the base to emitter of the transistor is 9/(120+100)K. This is approximately 0.04mA. One of the basic properties of a transistor is its current amplification property. A small current through the base to emitter allows a much higher current from collector to emitter. This multiplier is known as the gain of the transistor. For BC548 transistor, the maximum gain is around 800. Hence the maximum collector current due to the 0.04mA base current is 800×0.04 = 32mA. Usually LEDs are rated for a maximum current of 20mA and hence to protect the LED, we have added a 1K resistor in the collector circuit. 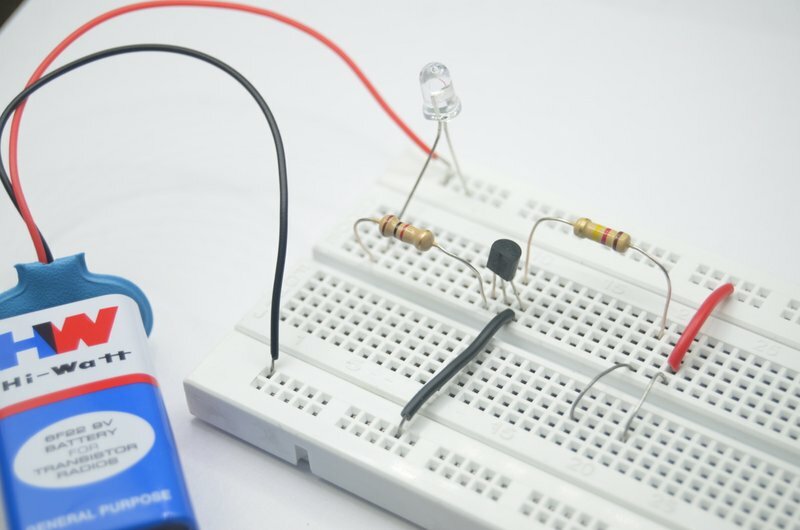 The voltage drop across an LED usually remains constant and is around 2V. Hence the approximate maximum current possible in collector circuit is (9-2)/1K = 7mA, even though the base current tries to drive a collector current of 32mA. 7mA current is sufficient enough for most LEDs to light up. The 120K resistor in the circuit is optional. Its only purpose is to protect the transistor in case you accidentally short circuit the touch points. Without the 120K, it will drive a large current through the base to emitter destroying the transistor. The following video gives a detailed explanation of the touch switch, shows you the components required and how you can build the circuit on a breadboard. You can replace BC548 with almost any other NPN transistor. Some of the common NPN transistors you can use are BC547, BC337,2N3904 or 2N2222. Please check their data sheet to find maximum current and the actual current gain offered by them. Also take special care to find the pin layout (location of collector, emitter and base terminals) of the transistor as it varies between part numbers. It is also fine to use slightly different values for resistors in the circuit. For example, 120K can be replaced with 100K or 150K. Similarly 1K resistor can be replaced with 470ohm or even 330ohm for a brighter LED. You can also use 5V instead of 9V.